Usually on April 15th; unless it falls on a weekend or legal holiday, then it's the next business day. 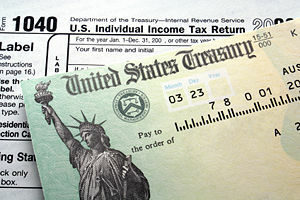 Tax Day is the day that you must have your income taxes done and postmarked/e-postmarked for mailing to the Internal Revenue Service (unless you filed an extension). This day can be celebrated in a couple of different ways. If you're unexpectedly getting money back, you could celebrate by planning what you'll do with that newly found cash. Or, you can celebrate that you finished your taxes on time. You wouldn't normally think of this day as being gifty, but with the glass-is-half-full frame of mind it can be... You could get yourself a gift to take some of the sting out of paying taxes, or a gift to celebrate that another year's taxes are done! This page was last modified on 26 March 2013, at 08:49.